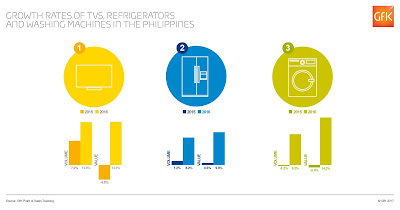 Demand for various big ticket household electronics and appliances surged significantly in the Philippines last year. According to recent findings by GfK, flat screen TVs, refrigerators, air conditioners and washing machines garnered the highest share of Filipinos’ wallets when it comes to spending in this category of household products. In January to December of 2016, 12.8 percent more TV sets were snapped up in the Philippines compared to the previous year, translating to a 12.9 percent corresponding growth in dollar value of the market. With this double-digit sales growth, TV continues to be one of the key technical consumer goods tracked by GfK which consumers in the country spend most on, totaling over USD595 million. 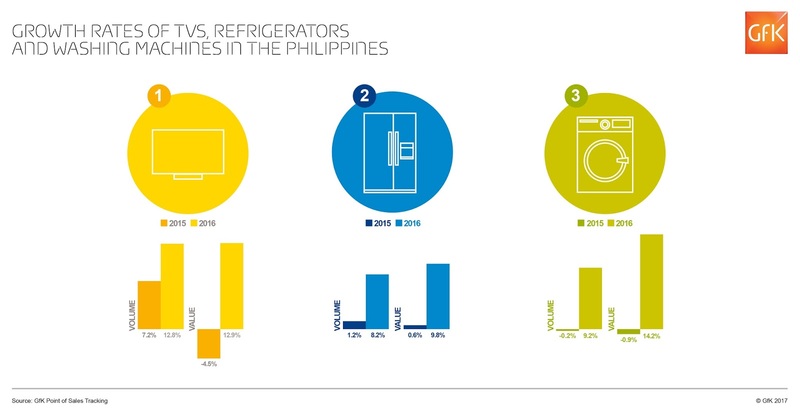 Across the other major household electronics and appliances, refrigerators registered the second highest growth, registering 9.8 and 8.2 percent more sales value and volume respectively over the previous year. Washing machines were also high in demand, at 14.2 and 9.2 percent value and volume growth compared to 2015. Despite a challenging global economic environment, the Philippine economy has grown at a rapid pace over the past five years, supported by sound macroeconomic fundamentals and a highly competitive workforce, which has increased economic optimism among the Filipinos. According to the Philippine Statistics Authority (PSA), the Philippine economy grew by 6.8 percent in 2016 - the fastest growth in the last three years; largely due to the increase in domestic demand, particularly in terms of investment and consumption. GfK’s Point of Sales (POS) Tracking experts keep customers fully updated on the retail and technical consumer goods products that are selling; including details on where, when and at what price, while tracking market share and brand performance to benchmark against the competition. Using POS Tracking data, GfK’s POS Analytics evaluate the sales impact and Return on Investment (RoI) of our clients’ sales and marketing activities. Using advanced econometric modelling techniques and leveraging GfK's rich tracking data assets we put clients in a position to simulate the outcome of their sales and marketing plans.